Three characteristic clinical features namely a high grade and persisting fever, a drowsy state known as tuphos and a skin rash individualize among all other febrile tropical illnesses, the so called "typho-exanthematic fevers". They are also known as "Rickettsial Diseases" after the name of their pathogens, the "Rickettsias", which is an unusual kind of bacteria. Several diseases are included in this group which, according to present medical authorities, are classified according to their epidemiologic mode and their geographic distribution. Health professionals had to face two of them in the French colonies as they are distributed world-wide. - Epidemic typhus or louse borne typhus which is the most dreadful one, has been reported since Antiquity with deadly epidemics occurring in the wake of wars and of massive human migrations. Sub Saharan Africa, among other places, was stricken by the serious pandemic which occurred shortly after the Second World War. - Murine typhus is the other cosmopolitan rickettsial fever which is rat flea borne. More stable than epidemic typhus, it is rife mostly in big colonial harbours such as in Dakar where foci were periodically reported. For instance, in 1935 Durieux* and Rivoalen* found the pathogen in many rats which had been caught on the harbour premises. In Shangai, Raynal* assumed that transmission of murine typhus could shift from rats to lice with the adaptation of the involved pathogen to the latter. In Indochina, Marneffe* in Saigon and Bablet* in Hanoi were also interested in researching this ricktettsial fever. Other rickettsial fevers have a regional distribution. Each of them is borne by a distinctive tick and its larvae. The Mediterranean shores, the American continent and the Far East have their own rickettsias and typhus. The French colonial domain was spared excepted for Indochina where the Asian typhus or scrub typhus was rife by the time of its independence war. In 1953-54, Guicheney* reported a series of one hundred and eighty clinical cases that he had been able to study in Hanoi and emphasized the importance of severe temporal headaches for the early diagnosis of this condition. Tick typhus also named "fievre boutonneuse méditerranéenne or "Marseilles red fever" is encountered in Provence which is a south-eastern region of France. Several scientists from Le Pharo Institute and also physicians from Marseilles Armed Forces Hospital connecting with their fellow physicians of Marseilles Medical School conducted researches on this condition. Some Pasteur Institute scientists have been carefully screening certain regions of Sub Saharan Africa as it looked rather odd that tick borne rickettsial fevers could spare this continent. In the 1930 British Scientists identified "an African tick borne fever" which was not found in French territories. A "Congolese red fever" was also described. 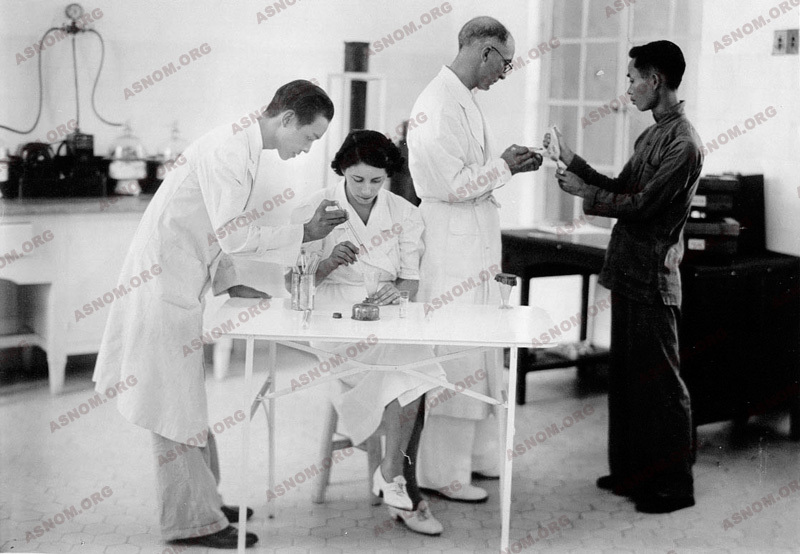 In the nineteen fifties Le Gac* in cooperation with Giroud* who was working in Paris Pasteur Institute, devoted a long time to researching this topic in French Equatorial Africa. With the help of either serological tests or skin tests he was able to identify usual typhus cases but also cases of another rickettsial fever with a rash mimicking the one seen with chicken pox. Jonchère* and Coll, suspected also that a "tick borne pimply fever" was present in French Western Africa. - Payet M. : Les rickettsioses. Conc. Méd. 1969,91, 46,8371-8378. - Raoult D. : Fièvre boutonneuse méditerranéenne. Rev. Prat. 1990,40,21, 1989-1991. - Tissot-Dupont H. : Histoire du typhus. Méd. Mal. Infect. 1995,25,823-829. - Tissot-Dupont H. Raoult D. : Epidémiologie de la fièvre Q. B.E.H. 5/93. - Tissot-Dupont H. Raoult D. : Epidémiologie de la fièvre boutonneuse méditerranéenne en France. B.E.H. 35/93.